As you know, this month Haiti is experiencing a wave of protests, some of them violent, and disruption of government (including the Prime Minister’s resignation) and daily life. We are relieved to report that the Bureau des Avocats Internationaux (BAI) team in Haiti is safe, although some members spent a night in the office when they could not go home safely. The protests were sparked by the announcement of crippling fuel price increases required by an International Monetary Fund bailout agreement. But the unrest has deep roots in Haiti’s history of poverty, corruption and foreign manipulation, and more recent roots in the flawed elections of 2015-2016 and the ostentatious corruption of the current government. BAI and IJDH have been fighting the root causes of this month’s unrest for the 23 years of our existence. After fighting for better elections in 2015/16 (with important, but limited success), BAI launched a Legal Observer Program with the U.S. National Lawyers Guild in May, to respond to the growing protests against corruption and misery, and the growing illegal repression of demonstrations by police. BAI lawyers go to police stations and courts to free people detained for legal protests. 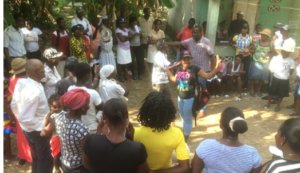 The Bureau’s civic engagement network brings rural Haitians together to learn how to better engage their government and connect with allies in Haiti and abroad. 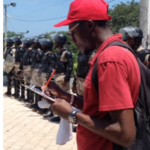 IJDH and BAI speak out about corruption, the return of Haiti’s brutal army, and police violence, and support Haiti’s cholera victims as they insist that the UN comply with its legal obligations to them. All of this creates opportunities for Haitians to peacefully organize for a better life and a better government. The Prime Minister has resigned; the fuel price increase is delayed; so Haiti currently has a respite. But we are confident that the large-scale protests will return sooner rather than later unless the underlying causes are swiftly addressed. 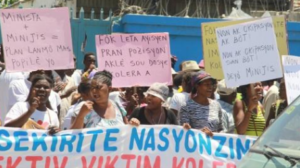 At IJDH and BAI, we will keep fighting for the accountability of Haitian and foreign governments for their decisions that impact human rights in Haiti and for the ability of Haitians to effectively engage their government. As we fight, we are constantly grateful to the many financial supporters, allies and collaborators who make this work possible.